The brake caliper is a component in the brake assembly where the pads and pistons are housed. If you have a stuck or hanging brake caliper, the brake pad won’t disengage from the brake rotor surface. This situation leaves you feeling like you are driving with the brakes slightly applied at all times because they are. Driving your car with a stuck brake caliper creates additional stress on your car’s other components and systems among other problems. Thankfully, knowing how to deal with this stuck caliper and other brake concerns, helps you tackle the situation with confidence. How Does a Hanging Brake Caliper Happen? There are several reasons you might have a sticking caliper. Here are the most common causes. Caliper Slides – the slides located in the caliper can freeze due to lack of lubrication, corrosion or debris build-up. When the caliper cannot slide properly in or out, this causes the brake caliper assembly to stick. Using a full-synthetic lubricant is important because it will reduce binding with age and won’t dry out like a non-synthetic grease will. The slides must be lubricated to travel in and out of the caliber bracket properly. They feature protective rubber boots which keep the lubrication in place, but sometimes, these rubber boots age, dry out, and tear over time, allowing rust and debris to penetrate. This causes them to stop sliding correctly and your brakes begin to stick or fail to engage completely. Caliper Piston – There is a rubber boot surrounding the piston. This boot protects the piston from dirt and grime. Sometimes, the boot can be torn when the piston is retracted back into the caliper when using improper equipment. Once this is torn, rust and other debris begin to build up. This stops the piston from sliding correctly. Brake Hose – over time, brake hoses begin to wear out. This leads to a small piece breaking off which can also result in a part of the hose remaining attached. Depending on how the hose fails, you might find the hose acts like a valve, allowing the brake fluid to flow one way and not the other direction. In other words, when you push your brake pedal down, the fluid might flow to the pistons and engage the pads, but when you let off, the fluid isn’t able to return back to the master cylinder. How Much Does it Cost to Fix a Brake Caliper? If you need hanging brake caliper repair, you must first evaluate the cause before you know what fix is appropriate. Because numerous reasons could be the concern, an inspection from a professionally trained technician is needed before a proper estimate can be given. 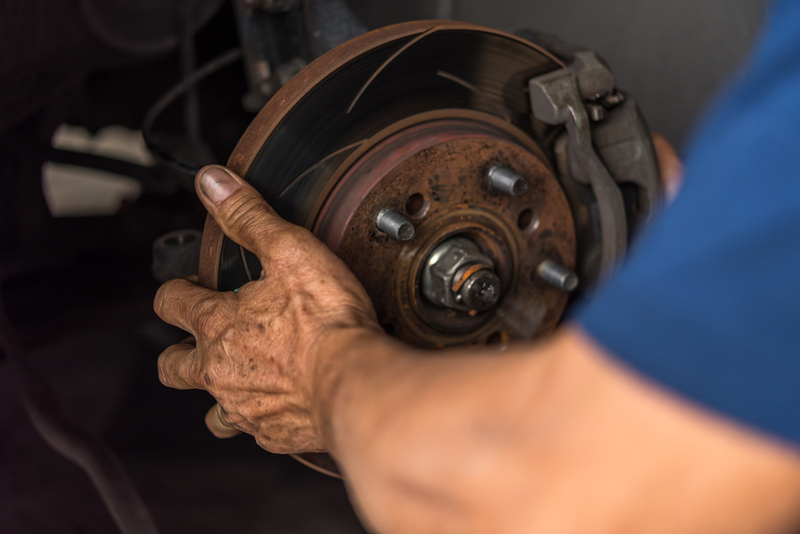 First, we need to determine that your brake pads aren’t the cause of the car’s trouble. If it’s just the pads, you don’t need new calipers. Furthermore, if it turns out to be a result of debris or build-up, we can generally clean the calipers and restore them to working condition. Similarly to many other car issues, the sooner you have it evaluated and repaired, the less likely you are to damage other components and incur more costly repairs. Ignoring a problem traditionally makes repairs more costly in the end. Your brake system makes the difference in whether or not you stop properly on the road. Maintaining your brakes is the number one thing you can do to ensure your family arrives at their destination safely. Aside from that, you want a qualified technician to inspect your car the second you notice something is wrong. Remember how we talked about the problems that arise from allowing untrained people to work on your brakes? If the bolts break or the rubber boots are lost, you might end up with larger problems than you started with. Furthermore, you want technicians that care about your car. If the shop only cares about getting the job done quickly and receiving payment, they might miss vital aspects of the repair process. That’s why when you come to Hollenshade’s for brake repair, we make sure everything is clean and the proper amount of lubrication is given to the entire system. Grease should be applied to the caliper slides, parking brake shoes to backing plate touch points and pad slides inside the caliper mount bracket. We also inspect all the brake system components when we work on your vehicle. Including the seals and pistons to assure there aren’t other problems coming around the corner. At Hollenshade’s Auto Service in Towson, MD, you can trust us to care for your car as if it were our own. We commit to serve you with efficiency, precision, transparency, and value. That’s why we continue to be a top trusted auto mechanic in the Baltimore area. If you notice signs that something isn’t right with your brakes, give us a call today: 410-828-5750 or email us to schedule an appointment. We will inspect the system and let you know what is happening. Don’t take a chance with your family’s safety – contact us now.